At the end of the year people take a look at their lives and they often come to the conclusion that they need to make some changes. If this describes you, you may have written a few New Year’s resolutions. By the end of January, most people have already forgotten all about them, but this doesn’t have to happen to you if you keep a few ideas in mind. Now that we are almost at the end of January I thought we would offer some tips on How to Keep Your New Years Resolutions. 1. Don’t expect major changes right away. You decided to lose 30 kilos, and you started a diet on January 1. So far,you are only losing a kilo or two each week. One way to keep from dropping your new eating habits is to remember that you didn’t gain 30 kilos overnight. So, be patient. It will take you as much time to lose the weight as it took you to gain it. Remember that you don’t have to lose the entire 30 kilos this year. You decided to start eating better and exercising on a regular basis, and these are lifestyle changes that you can keep for the rest of your life. You don’t have to think that you failed if you aren’t 30 kilos lighter when December 31 comes around. 2. Accept the fact that you will not do everything perfectly. You know that it’s hard for you to leave pizza on the table and that it keeps you from fitting into your skinny jeans. So, you vowed to eliminate this food item from your diet. You may have already broken this promise, but that doesn’t mean you have to give up the resolution to lose weight. If you find it hard to stay on your diet, you don’t have to call yourself a “failure.” It’s better to think of times like these as learning opportunities. Remember what made you want to eat the pizza in the first place, and write it in a journal. Then, you can find ways to avoid those situations in the future. 3. Look for someone to give you moral support. Everyone needs moral support when they are starting a new adventure, so friends and family can be very helpful to you at this time. Let them know what you are trying to do, and tell them that you need their help. Your friends and family want you to be happy, and they will be eager to be your own personal cheering section. If you have a significant other who also wants to lose weight, your job will be much easier because couples who begin a diet together tend to succeed more often than those who try to do it alone. Did you write down the reasons why you want to lose weight? If not, you can easily forget why you made this resolution in the first place. Then, it will really be hard to lose the extra pounds. Without the proper motivation, the next time you go to the gym could be your last. To keep from losing your enthusiasm, make a list of the reasons that you want to lose the extra weight. Then, make a point of reading this list often. Smartphones are convenient tools that can help you with this tip. Type your list of motivating factors directly into your smartphone, and you will always have it with you everywhere you go. 5. Don’t be afraid to make adjustments. 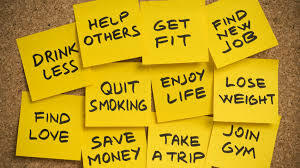 It doesn’t take much time for people to give up their New Year’s resolutions for good because they believe they are not working. This may only mean that you chose the wrong way to accomplish your goals. You may have decided to take up jogging, but you found out that you really don’t like to jog. Rather than throw this resolution away, stop jogging, and find something else to do. For example, you might like swimming or aerobics classes more than jogging. Then, keep the activity going, and remember to have fun.